While travelling through Vietnam I had the opportunity not only to taste fresh edible rice paper but also to watch how it is made. In Vietnam edible rice paper is used for making fresh or fried spring rolls and is called bánh tráng I couldn’t believe the ingredients for rice paper is only white rice flour, tapioca flour, salt, and water. It shouldn’t be hard to make then should it? But I found out that for something that is made out of so few products it is quite a complicated process. I got to watch an artisan banh trang producer in Phan Thiet, just outside of Ho Chi Minh City. This woman had been practicing her craft for decades and as their rice paper is made by hand and are bigger than normal they can sell them at a higher price than the factory-made ones. 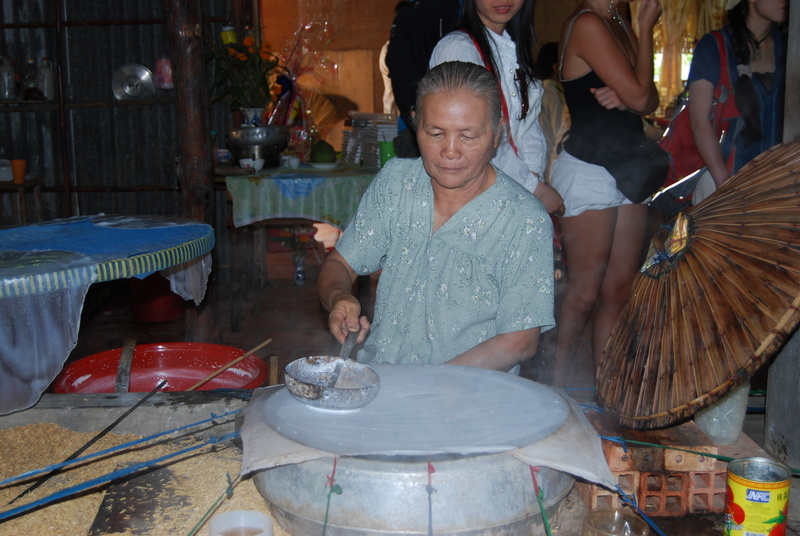 First she ground soaked raw rice with water into a pulp before spreading the batter onto a cloth that’s stretched over a wide pot of boiling water. After the batter had been thinly spread (note the wide tool that she uses below), a bamboo lid covers the rice sheet and it’s steamed for probably about 30 to 45 seconds. 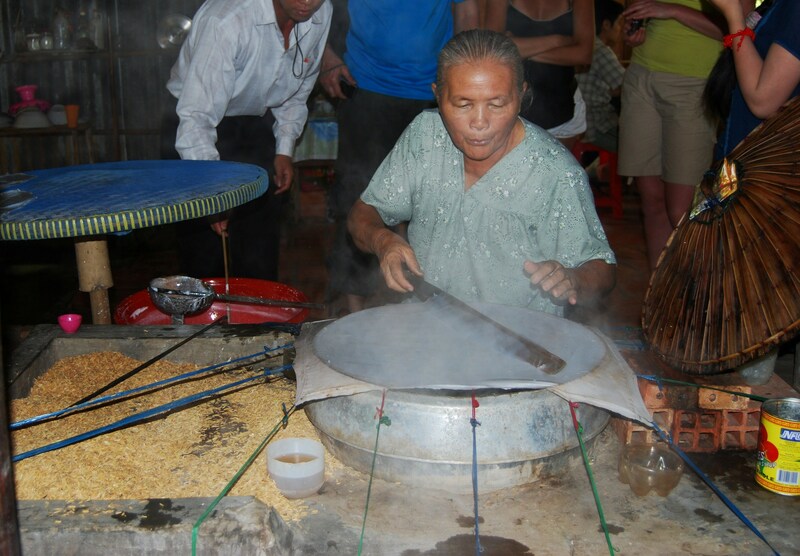 Next she used a long narrow stick to lift and transfer the cooked rice sheet to a cooling “rack”. The cooling rack is a very wide slightly domed round bamboo rack with a cloth covering it. The rack spins around and by the time the rack completes a full spin, the rice paper is cool enough to handle. Another woman then picked up the cooled rice paper and placed it on a bamboo drying rack that resembles a narrow 6-foot-long stretcher. 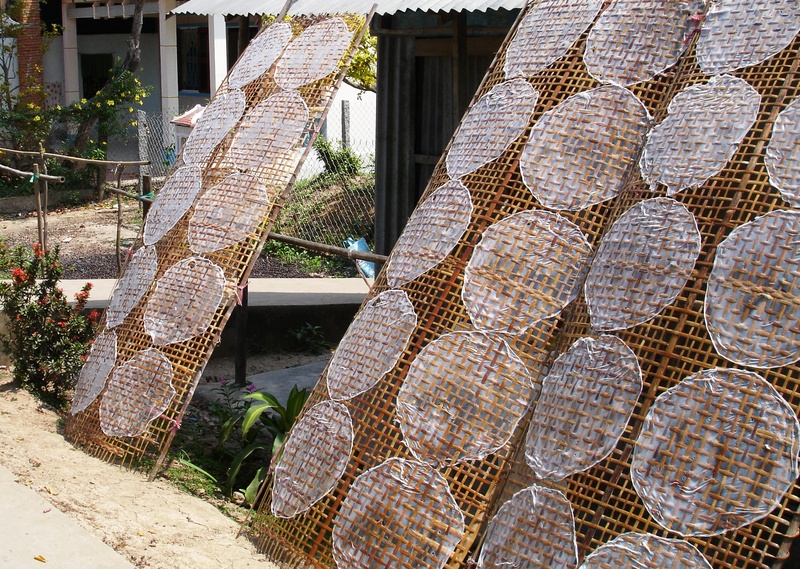 To dry the cooked rice sheets into rice paper, the racks are placed outside under the hot sun for a day. It is the woven pattern of the racks that gives the rice papers their distinctive appearance, which factory-made ones only mimic. The dried, finished rice papers are stacked up, then tied into smaller stacks and taken to market. These rice papers, which were about 14-inches wide, are sold for a premium because they’re made by hand. After watching this whole process we got to taste some of the fresh, hot rice sheets with a fish dipping sauce, which was fabulous. Fresh rice paper tastes completely different from the dried ones that you have to wet with a bit of water to get them supple again. O wow! this is so cool!! thanks for sharing!!! and now I really need to get myself to vietnam!!! I hope you get to visit and explore Vietnam, it is such a wonderful country! Thanks Suzette and glad you have joined my journey! Wow, that looks pretty amazing! Thank you and a huge welcome to my journey!! This is really neat and what an opportunity! I’ve got a package of rice paper that’s part of a spring role kit in front of me and wondering now how a machine made the special patterns. I put a link to this post on my site in answer to another blogger’s question. If you would like to see it, here is the link. http://japancanmix.com/2014/08/16/photo-fridays-1-tantanmen/ Have a great day! Thanks Hilary! Making your own spring rolls at home is so much fun, even if the paper is machine made. This is exactly the kind of thing I like to see/do when I travel. Thanks for sharing your experience. Thank you! I love learning about a country and culture through their food. Thanks Christy! I would have taken way more photos but there were so many people around that it was quite difficult. Fascinating. I wouldn’t mind eating an almond macaroon if it had a base the size of one of those rice papers! That sounds so delicious!! Death by macaroon! So interesting. Your photos made me feel I was standing there in front of her watching her make them. Thanks Colline. I was quite lucky to get that close as there were quite a lot of people standing around watching her work. I definitely agree with that Sangeeta. It is a thousand times better than store bought products. wow. so thats how it’s done! love the pics! Thank you! And believe me they taste way better than the store bought ones. Thanks for sharing this interesting process. Such skills are getting rarer as the older generation lays off work, all over the world. Maybe in a few generations they will not be made by hand anymore. That is so sad but true, the younger generations don’t appreciate hand work anymore and if it can be done by machines or technology so much the better for them. Lots of traditions are being lost this way. skinny rice sheets were always so intriguing to me… thanks to you now I know the intricacies of how they are made! So interesting! Great blog J. Thank you! I just love fresh spring rolls and knowing how much work goes into making the rice paper made me appreciate them so much more. What a time consuming process… Thanks for showing us, Janaline! Its looks like such delicate work Amy. She has been at this for years and makes it look so easy. I didn’t know how it was made, but I love making egg rolls! Thanks! Its quite interesting if you think about it, the amount of things we eat but have no idea how or from what they are made. I found this very interesting. Thanks for documenting the process! Thanks Kathie. It is such a delicate process actually. Interesting. I’ve not seen this process before. You’re welcome. I loved the fresh spring rolls in Vietnam so it was quite cool to see how they make it.